When I realised 2018 marked the 10th anniversary of Sydney’s bright winter star – Vivid Sydney festival – I knew it would mean big things. I mean, Sydney already pulls out all the stops; special Vivid cruises, restaurant offers – and the streets more ‘lit’ than any Gen Z kid could ever possibly explain. 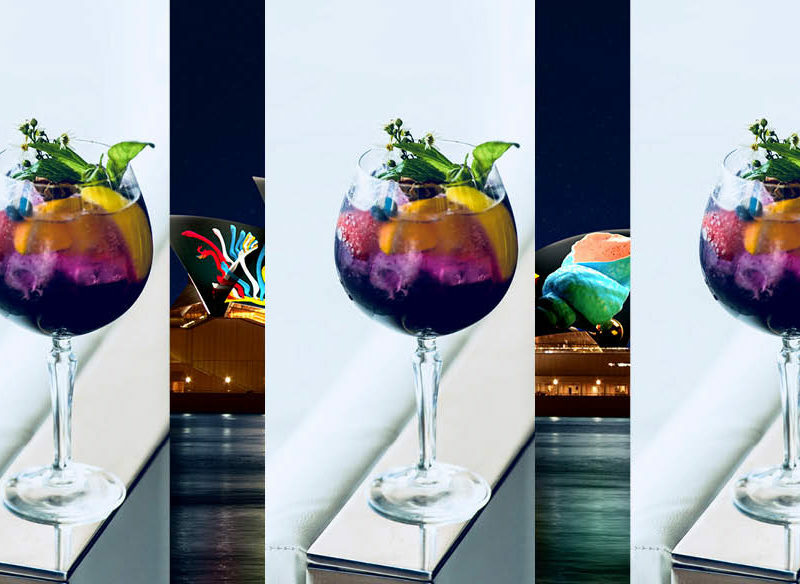 Now, some of Sydney’s best bars are also doing their bit to get into the spirit of Vivid, and what it means for us is a carefully curated cocktail trail that appeals to a wide variety of palates. 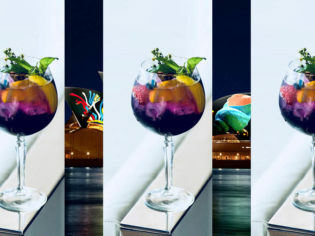 Spanning Darling Harbour to Circular Quay, the trail links together the bars that have taken it to the next level; creating a limited edition cocktail specifically for the Vivid program. 5pm: check in to the Novotel, Darling Harbour. The smell of fresh paint alerts me to the fact that ongoing renovations are happening* – and the clean, modern format of the rooms is satisfying as I look out the window and see the beginning of the 6pm show lighting up Darling Harbour. 5.30pm: take an Uber to Silvester’s at the Marriott. The celebrated five-star restaurant is running a special Vivid Dinner, Dessert and Wine offer, where for $50 per person you can enjoy either an entrée, main and glass of wine, or a main, dessert and glass of wine. The chef carefully selects options to choose from daily, but if you can get your hands on the scallops with miso cauliflower and squid ink crisp – I highly recommend you go for it! Kick off the cocktail trail! 7pm: head next door to begin the highly anticipated Vivid cocktail trail, kicking off at Three Bottle Man. It only takes us a few steps from dinner to reach our first destination, seeing as it is part of the Marriott. Hidden away on Bulletin Place, you’d be forgiven for missing this quaint bar front. Its signature Vivid cocktail is called ‘Stars in their Eyes’ and is unlike anything I’d ever tasted. Made with salted caramel and banana Starward whisky, apple juice and a dash of chocolate bitters, it’s about as far from the taste of ‘whisky’ as you can imagine. I could down around five more – but somehow manage to exercise restraint. 7.45pm: head around the corner to Customs House Bar. Known for having an incredible array of craft beers on tap, I am surprised to learn that the bar is also well versed in what it takes to create a standout cocktail. The ‘Vivid dreams’ concoction is made with Tito’s handmade vodka, vanilla Galliano, Bianco Vermouth and Absinthe. It packs a punch – that’s for sure, but also manages to reflect the unique, whimsical nature of Sydney’s celebrated winter showcase. 8.30pm: leave the bar and take a walk around Circular Quay. With a fresh dollop of liquid warmth in our bellies, we walk by Customs House and witness a projection show starring May Gibbs’ beloved Snugglepot and Cuddlepie. Dazzled by passing punters wearing light-up flower crowns, we edge our way towards the MCA, taking in the magic of the Opera House and Harbour Bridge as we stroll. We stop by the light installations near the MCA and watch gleeful children attempt to hug the huge Wobbelees installations. We then make our way up towards the 1000 origami cranes on George Street, all lit up and hung from the ceiling. It’s impossible not to photograph them and get a little lost in the lights. 9.30pm: make your way to Grain Bar at the Four Seasons hotel. Its signature Vivid cocktail is called ‘Craft the Elements’ and is made with Starward Solera whisky, Luxardo maraschino, Dom Benedictine, chocolate bitters, black walnut bitters and orange bitters. Ah, here’s that warm and fuzzy feeling again. 10.30pm: hop on board the train at Circular Quay and ride the two stops to Town Hall, before walking to Zephyr Sky Bar at the Hyatt Regency. When you exit the lift at level 12, a few extra steps takes you to one of the most stunning rooftop bars the city has to offer. With sprawling views of Darling Harbour, you’re treated to the ultimate light show from above. We nestle in near the heater and order the aptly-named ‘Vivid cocktail.’ A little different to what we’ve already had tonight, this dark-coloured concoction is made with Adelaide Hills Distillery 78˚ lavender infused gin, spiced blueberry syrup, butterfly pea, lemon and a dash of falernum. It’s also as big as my head, so be sure to dedicate some time to get through it! NB: it’s delicious, so you’ll have absolutely no problem. 11.30pm: make your way back through Darling Harbour to the Novotel for a nightcap before bed. The mulled wine served at signature restaurant, The Ternary, is just what is needed to warm up my insides after the fresh walk home and send me into a peaceful, totally satisfying slumber.